For more than 200 years, Soda Crystals have been cleaning nearly everything in England. Now, they are available in the USA. Unlike modern cleaners and detergents, Soda Crystals contain no phosphates, no enzymes, and no bleach. They contain no perfume, and they have no odor. Actually, Soda Crystals contain no "extra" anything. Which is quite rare these days. Using only one active ingredient and a trace amount of two others to keep the crystals from clumping, Soda Crystals dissolve grease, soften water, and loosen dirt the old-fashioned way--powerfully, simply, and without harsh chemicals. Soda Crystals are easy to use. You mix them with water to make a mild solution, a regular solution, or a strong solution. You can even make a brawny cleaning paste to dissolve stubborn stains. Visit our Pictures page to see what Soda Crystals look like. Say "good-bye" to grease! Use Soda Crystals in the kitchen to clean blackened or burnt pans, work surfaces, teapots, tea stained cups, chopping boards, kettles, silverware, floors and tiles and greasy cooker hoods and filters. Remove stains and boost the cleaning power of Soap Flakes or your laundry detergent with Soda Crystals. Soda Crystals are a recognized way of softening water, loosening dirt, and dissolving grease. Soda Crystals will remove stains too--just soak items stained with grease, grass, blood, ink, wine, tea or coffee in a solution of Soda Crystals and water and break down the stain so your regular wash cycle can easily handle the rest. And Soda Crystals can be safely mixed with Soap Flakes, borax and baking soda. Use Soda Crystals to clean toilets, waste pipes, floors and tiles, grout, wastebaskets, shower curtains, combs, and sponges. And Soda Crystals are safe to use with septic tank sewage systems. A mild solution of Soda Crystals will remove dead bugs and grime from your windshield and a regular solution will clean grease and road grime from your wheels. Simply spray the liquid onto the wheels making sure that any recessed areas are covered and leave to soak for at least ten minutes. Then either brush the wheel or rub with a cloth or sponge and then rinse. Note: Do not use on aluminum alloy wheels and take care to avoid paintwork. Soda Crystals should not be used on bodywork. Soda Crystals have long been a favorite with environmentally conscious consumers as Soda Crystals do not contain any phosphates, enzymes or bleaches. They are completely biodegradable and do not harm your lawn. And Soda Crystals do not contain caustic ingredients so they are safer to work with than many modern products. Yet you can clear moss, rotting leaves, and get rid of algae and slime outdoors with little effort. Want a cleaner barbecue and outdoor deck? Soda Crystals are safe to use on wooden decking. No harsh chemicals, nothing to hurt your lawn. Also great for cleaning barbecue grills and utensils. Wipe on or soak--wait about an hour--and your grill and utensils can be rinsed off and wiped clean. A wire brush or scouring pad will help remove burnt-on food. Use on garden tools too. Lawn mowers, planters and pots--terra cotta, stone, or plastic. Unlike modern cleaners with harsh chemicals and only one or two specific cleaning uses, Soda Crystals can be used the way YOU want. Mix a solution as strong or as weak as you need. You can even make a powerful cleaning paste or use Soda Crystals right out of the bag, "dry". Note: Soda Crystals should not be used on aluminum as the finish may discolor. Also avoid using Soda Crystals on lacquered finishes as the lacquer may be weakened or removed. While Soda Crystals are not caustic, if you are submerging your hands in a solution for a long time, it is advisable to wear rubber gloves--especially if you have sensitive skin. Do not breathe dust. Keep out of the reach of children. If swallowed seek medical advice immediately. Soda crystals are not like baking soda. Soda Crystals are different. Baking soda is sodium bicarbonate, Soda Crystals are sodium carbonate decahydrate. In some countries Soda Crystals are carefully used in food preparation and water treatment. And veterinarians sometimes use Soda Crystals on dogs who ingest foreign objects, but in general, you should consider Soda Crystals a cleaning product and exercise appropriate caution. 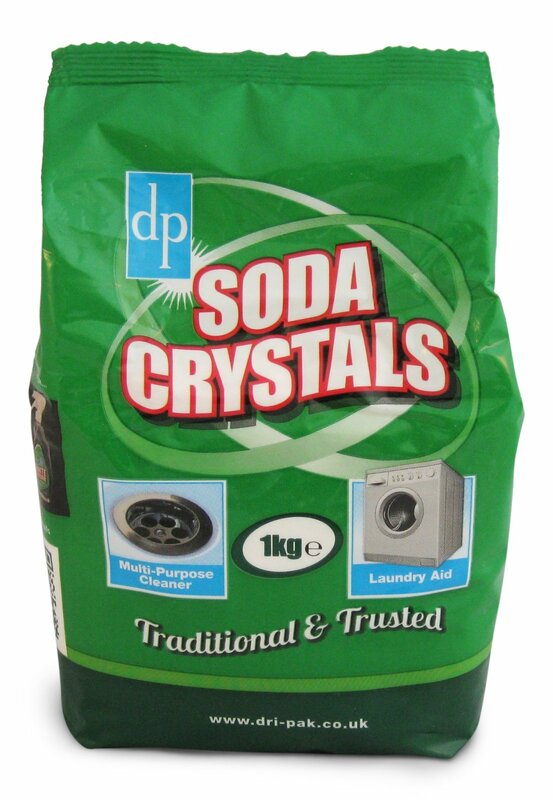 Dri-Pak Soda Crystals have been used for generations as a way to clean, loosen dirt, dissolve grease and soften water. They are free of bleach, enzymes and phosphates. Soda Crystals should not be used on aluminum. See our FAQ page for more detail. Soda Crystals are safe to use with septic tank sewage systems. Stains: Remove heavy stains on cottons or linens by soaking in a strong solution of Soda Crystals. Soda Crystals can remove grease, blood, ink., tea and coffee stains. New woolens and blankets: Soak in a cold, mild solution before carefully washing--leaves blankets and woolens soft and fluffy. Greasy work clothes: Soda Crystals are renowned for their ability to dissolve grease. Soak greasy clothes and textiles overnight in a strong solution, before washing normally. Delicates: To hand-wash fine materials use a warm, mild Soda solution. Note: Always test fabrics for colorfastness before using Soda Crystals to soak, wash or remove stains. Water softening: In hard water areas, Soda Crystals have long been used to reduce the lime scale in water. This means that you can reduce the amount of the detergent you would use in a washing machine to the manufacturer's instructions for "soft water". It also improves the efficiency of the machine and reduces the risk of breakdown and expensive repair bills resulting from lime scale buildup. 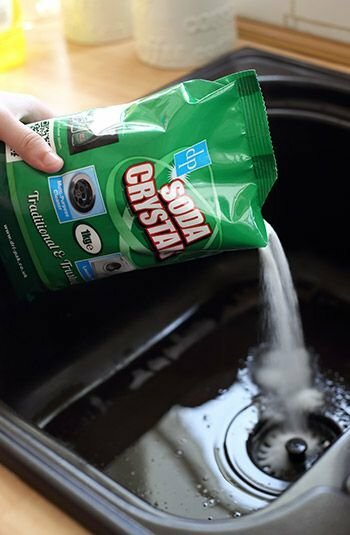 Add half a cup of Soda Crystals to your wash load. Diapers: Rinse out diapers and begin soaking them immediately in a strong solution of Soda Crystals. Follow the soaking with a warm or hot machine wash. Cleaning blackened/burnt pans: A strong Soda Crystals solution is very effective for removing burnt-on grease from pans and casserole dishes. Soak stubborn stains overnight. Note: Soda Crystals are not suitable for aluminum pans. Grill pans: Burnt-on stubborn grease in grill pans will be easy to clean after an overnight soaking in a strong solution. Note: Soda Crystals are not suitable for aluminum pans. Cookers: Cut through grease and burnt-on food by cleaning with a strong solution. Leaves enameled surfaces gleaming. Floor tiles: Uses a strong, hot solution to cut through ground-in dirt and leave tiled surfaces sparkling clean. Note: Soda Crystals will remove any wax polish on the surface. Cleaning teapots, cups and vacuum insulated bottles: Tannin can leave nasty brown stains in teapots or cups. Clean them with a strong solution. A soak for one hour--or overnight--will help to clean badly stained items. Dishwashing: Soda Crystals are a natural alternative to dishwashing liquids. Use a warm to hot, mild solution. Crockery and glasses will come up shining. Do not use Soda Crystals on aluminum items. Glassware: After a wash and wipe in a very mild solution, glassware will sparkle. Chopping boards: Scrub with a regular solution to get rid of lingering smells without tainting food. Rinse thoroughly. Mops and dishcloths: Soak in a strong solution in hot water to remove dirt and grease. Windshields: A mild solution of Soda Crystals will help remove dead flies, bugs and grime off windshields. Avoid splashing onto paintwork. Remove any splashes immediately. Wheel trims: Use a regular solution of Soda Crystals to remove grime and grease. Note: Do not use on aluminum alloy wheels and take care to avoid paintwork. Soda Crystals should not be used on bodywork. Green fly: Spray trees or plants with a solution of 4 ounces by weight of Soap Flakes and 2 ounces by weight of Soda Crystals in 2 gallons of water. Mildew and blackspot: Spray roses with a solution of one cup of milk and 2 ounces by weight of Soda Crystals to each gallon of water. Patios and paths: A brush down with a strong, hot solution will remove the slime left by rotting leaves and moss, and will also help to keep paved areas moss-free. Sprinkle directly onto moss, leave overnight and rinse off. Avoid spilling or spraying onto plants. Stonework: Clean steps, driveways and stonework with a strong solution. Avoid spilling or spraying on plants. Barbecues: Soda Crystals are renowned for their ability to cut through grease, so they're ideal for cleaning barbecues. If possible soak components in a strong, hot solution for an hour or more before rinsing well with clean water. Use a strong solution and scrub grills and pans with a stiff brush. Patio furniture: Grimy plastic garden furniture will come clean with a strong solution of Soda Crystals. Outdoor decks: Dissolve a regular solution of Soda Crystals in hot water and scrub as usual to make a moss and algae-free surface with reduced slip factor. Paintwork: Paintwork-and vinyl window frames--will brighten after a wipe down with a regular solution of Soda Crystals in warm water. You can prepare bare wood for painting too with a regular solution. Paint or varnish preparation: To prepare wooden flooring for varnishing or painting, make sure that all debris is removed and then mop with a strong Soda Crystals solution. Change solutions when they look dirty in the bucket to prevent re-spreading the dirt around the floor. Blinds: A wipe with a regular solution will brighten venetian blinds, and help to shrug off dust. Do not use on aluminum blinds. Cane furniture: Cane and wicker furniture will come clean after a wash with a regular Soda Crystals solution. Soda Crystals will also help to harden the cane and tighten sagging seats. Upholstery and carpets: Soda Crystals are ideal for getting out wine stains. Dab upholstery with a mild solution to get rid of stains--or simply to freshen up the fabric. Take care not to scrub wool or other upholstery fabrics--it could damage them. Always test fabrics for colorfastness before using Soda Crystals. Windows, mirrors and tiles: A very mild solution gives windows, mirrors and wall tiles a sparkle. Unblocking and cleaning drains: Because Soda Crystals dissolve grease, they're great for unblocking drains and waste pipes. Add Soda Crystals to the drain and wash through with hot or boiling water. Use a plunger for badly blocked drains. This is an effective method and avoids the need to use expensive dangerous caustic drain cleaning chemicals. Use a strong solution to flush drains regularly to keep them grease-free. Wastebaskets: Clean out wastebaskets with a regular solution to keep them clean and odorless. Silverware and jewelry: To put the shine back into silver with ease, make a solution of one cup of Soda Crystals to a pint of very hot water and soak for 5-15 minutes in a bowl lined with aluminum foil. The tarnish will simply melt away. Rinse off and buff. Soak delicate jewelry in a regular solution. Soft stones such as Opals should not be cleaned using Soda Crystals. Brass and pewter: Will polish much more easily if first washed in a strong, hot solution of Soda Crystals. Wine and food stains: Red wine and food stains can be treated with a strong solution of Soda Crystals. Large spills can be treated by applying dry crystals directly to the stain, followed by rinsing in clean water. Use Soda Crystals for ink and grass stains too. Garbage cans: A strong solution of Soda Crystals will loosen and remove dirt, grime and sludge. Baths, basins and showers: Use a regular solution to freshen up baths, basins and showers. It cuts through grease, soap scum and lime scale. Do not use Soda Crystals on lacquered taps and fittings. Toilets: Flush some Soda Crystals down the drain to clean and freshen, and to help prevent blockages. Use them to clean toilet brushes too. Waste pipes: Use a strong hot solution to keep waste pipes clean and fresh. A regular flushing will help keep waste pipes clear of blockages. Floors and vinyl tiles: Clean the bathroom floor with a regular solution. Ceramic or vinyl tiles will clean up beautifully--but please note any polish on wood or vinyl floors may be removed by using Soda Crystals. Tiles and grouting: Clean wall tiles with a regular solution to leave them clean and sparkling. Soda Crystals will bring new life to grouting too. Sponges and combs: Freshen them up and get rid of that "greasiness" with a soak in a regular hot solution of Soda Crystals. Shower curtains: Clean, deodorize, and remove soap scum and mildew from your vinyl shower curtains with a strong, hot solution of Soda Crystals. Dri-Pak also makes Soda Crystals packaged for industrial, agricultural and commercial uses under the ELCO brand name. Soda Crystals are an excellent raw material to add to products. They provide alkalinity for use in formulating detergent and cleaners. Soda Crystals can be used as a replacement for Soda Ash in liquid formulations, thereby removing the need for intense, elongated batch times and avoiding heating of the solution to ensure dissolution. Soda Crystals will not cake during mixing as the stable monohydrate phase that can inhibit the Soda Ash dissolution is avoided. Soda Crystals can be used as a tablet binder and a lubricant to help the compaction of difficult materials. The bonding of the high content of Water of Crystallization disrupted during compacting in a tablet press or granulator recrystallizes on standing to produce a hard, well-defined tablet. Soda Crystals provides excellent heavy-duty alkali cleaning for plants such as oil works, petrochemical plants, equipment and yards. Used effectively for acid neutralization in many industries such as acid tank farms and acid manufacturers, and waste treatment works. Zero foam and surfactant-free qualities makes Soda Crystals an excellent choice for pipeline circulation cleaning. Soda Crystals are also suitable for effective cleaning in meat and food processing. Soda Crystals are used to clean equipment and surfaces in kitchens, especially for removing grease and fats from deep fat fryers, pans and other equipment where residue may build up. Also used for dipping woks and pans to remove spices and odors in fast moving kitchens. Dairy Circulation Cleaning - A traditional, easy to use dairy pipeline circulation cleaner. Soda Crystals dissolve fat and grease and, when circulated with a hypochlorite solution, provide effective disinfection and a solution that is safe to dispose of. For low bactoscan levels, clean twice per day using around 3.3 lbs. to 6.6 lbs. of Soda Crystals per 66 gallons of hot water, with around 1 pint of hypochlorire solution. Circulate as normal ensuring all pipelines and meters are full, then rinse with a weak hypochlorire solution. Adjust solution strength depending on current bactoscan levels and water hardness. Continue normal pattern of descaling and use of milk stone remover. Drain, yard and equipment cleaning - Soda Crystals are an alkali cleaning agent that will neutralize acidic grease and fat, forming a water soluble emulsion that is ideal for drain and yard cleaning. Add Soda directly to drains and flush down with hot water - or wait for rain to dissolve. Repeat weekly to keep drains clear from blockage. For oily yards, sprinkle Soda over the soiled area - dampen area with water, then wait for rain - or powerwash yard clean. Driving over the Soda before washing off can provide even better results. A solution of Soda Crystals is ideal for cleaning sprayers and other agricultural equipment - rinsing through with cold water after washing. 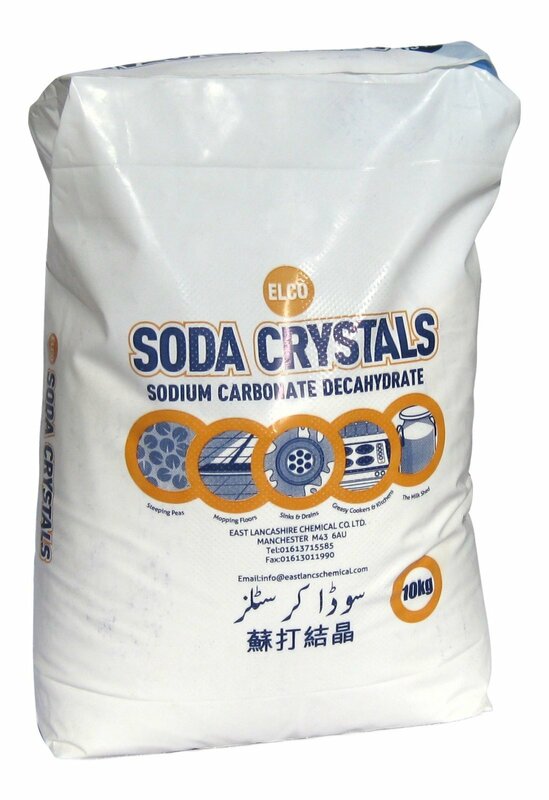 Soda Crystals are also suitable for use in septic tanks. Foot and mouth disinfection - Soda Crystals are recognized as an effective hoof and mouth disinfectant and have been used in England by the agricultural industry and the ministry since the 1960's. They are approved at a minimum level of dilution of 4% in water - and best used with a small addition of dishwashing liquid to help with wetting. Contact us directly for more information and pricing on ELCO Soda Crystals used in industrial, commercial, and agricultural applications. Dri-Pak Soda Crystals are available in 2.2 lb. bags. Wholesale packs are sold by the case. One case contains 12 bags. Pallet loads also available. Bulk size ELCO Soda Crystals 22.04 lb. bags are now available and in stock. Soda Crystals have now been around for 200 years. If you don't try them today, they'll still be here tomorrow, or next month, or next year. But why wait? With a complete money back guarantee if you aren't satisfied, you won't lose your money...you can continue looking for a product that suits your needs...with a full wallet. So give Soda Crystals a chance and see if they work for you. We can write about Soda Crystals, and show you pictures, but in the end, you've just got to try them for yourself. Might you be interested in some soap too? Like dry Soap Flakes or Liquid Soap Flakes?